In the practice of feng shui, the kitchen is considered one of the key rooms in a home, and it represents nourishment and prosperity for all who enter. 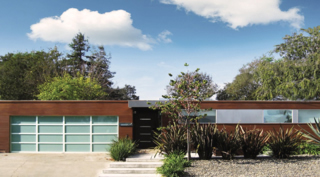 Designer Yujin Jeon used the ancient Chinese practice to design a modern makeover of the East Bay Eichler she shares with husband Kevin Toyama. 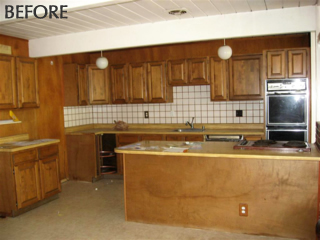 The original kitchen was located in the middle of a room, basically dividing the space to two smaller areas. It also presented a feng shui challenge: the cooking space faced the front door. Feng shui recommends that it is better if you don't see the kitchen immediately upon entering the house. Doing so can signify digestive, nutritional, and eating problems. Having the kitchen at the entry point can also mean that guests will come over and eat and then leave immediately. It can also encourage the family to eat all the time. To solve the problem of location, Yujin shifted the kitchen from the center of the space to a corner so that it was no longer visible from the home's entrance. In feng shui, it is also important for the cook to be in a commanding position when at the stove, which means facing the kitchen entrance and not with his or her back to the door when cooking. Therefore, Yujin designed a long cooking island that provided plenty of prep and storage space. It also created plenty of bar seats for dining. "It's the perfect potluck gathering, and comfortable for ten people to sit in the kitchen," she says. Feng shui-inspired kitchen design dovetails with the contemporary trend toward group cooking. Instead of isolating the cook, families and guests gather in the kitchen and participate in cooking. A busy couple, Yujin and Kevin also use dinner prep as an important time to unwind together. "We have a lot of parties, and while we are cooking we can see the guests and we can see into the family room," Yujin says. Natural materials played an important role in the design, so the couple chose natural wood cabinets with dark and light finishes for contrast. White granite countertops and travertine floors cover the horizontal surfaces. On the walls, Yujin created a custom gray-taupe paint color with just a touch of green in it, which brought out an earthy feel. Lighting also played an integral role in the overall design. The couple added indirect lighting in a soffit above the kitchen. To bring the outdoors in, Yujin designed a cupboard along one wall, with a glass back that allows natural light into the space. At night, the cabinetry acts as a light box. Light fixtures mimic the look of the original Eichlers—clean-lined and simple.